This photo shows a Christmas display at Backyard Primitives & Designs in Bainbridge, where photos with Santa will be available from noon to 5 p.m. Saturday, Dec. 8 during Christmas in Bainbridge. The Bainbridge Connections group will host its annual Christmas in Bainbridge event on Saturday, Dec. 8. Festivities include a ribbon-cutting, business open houses, a tour of homes, coffee and cocoa tasting, photos with Santa, a parade of lights, and more. At 1 p.m. in the center of town, Bainbridge Mayor Rocky Countryman and past Fall Festival of Leaves Queen Gloria Peters will hold a “Bainbridge is Open for Business” ribbon-cutting in honor of the many new specialty businesses that have opened in the village over the past year. The Tour of Homes, from 2-5 p.m., is a self-guided tour featuring six stops across the village, all beautifully decorated for the Christmas season. Tour tickets are $10 and can be purchased in person at Backyard Primitives & Design at 107 E. Main St. in Bainbridge or online at bainbridge.group. Following the Tour of Homes will be the village’s first Parade of Lights starting at 5:30 p.m. and traveling down Main Street between Maple and Quarry streets. The parade will include a variety of tractors and vehicles decorated with lights and will feature Santa Claus riding in his antique sleigh. “We’re so excited for this year’s Christmas in Bainbridge festivities. Our little village is growing in wonderful ways and this year’s holiday events are a great example. 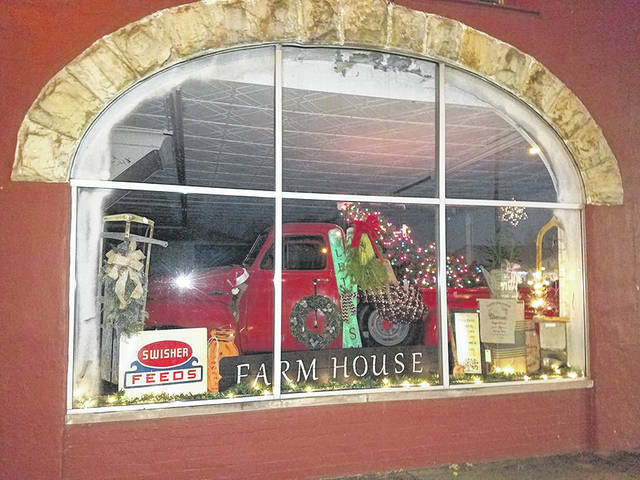 A visit to Bainbridge this holiday will be like walking right into a Hallmark movie Christmas,” said Beth Harrison, a Bainbridge Connections and Bainbridge Community Center member. Other events in the village on Saturday include photos with Santa at Backyard Primitives from noon to 5 p.m., coffee and cocoa tasting plus fresh Christmas greens at Ancient Valley Mercantile from 10 a.m. to 7 p.m., fresh baked cookies at Wallpapers Borders from 9 a.m. to 4 p.m., extended hours at the gift shop at McFadden Pharmacy from 9 a.m. to 5 p.m., wine tasting and extended hours at My Gypsy Soul Boutique from 10 a.m. to 5 p.m., a cookie assortment at C&L Treasures from 8 a.m. to 4 p.m., and peppermint snowflake cheesecake sold by the Slice at Mystic Cheesecakes from noon to 5 p.m. The evening will culminate with a ’50s and ’60s rock concert at the Paxton Theatre. “Terry Lee & The Rockaboogie Band is a high energy, first-class show band built around the lightning fast piano pumpin’ of London, England’s Terry Lee. Performing a large selection of popular hits from the 1950s and 1960s, Terry Lee & The Rockaboogie Band always leave audiences on their feet during their annual performances at the Paxton Theatre,” a news release from the theatre said. Concert tickets can be purchased at 740-634-3333 or at PaxtonTheatre.org. For additional information on Christmas in Bainbridge, call 740-634-0087, email info@bainbridge.group, visit bainbridge.group or follow Bainbridge Connections – Ross Co. on Facebook. Information for this story was provided by Wade Hamilton, The Paxton Theatre. https://www.timesgazette.com/wp-content/uploads/sites/33/2018/12/web1_Christmas-Open-Houses-Backyard-Primitives-Design.jpgThis photo shows a Christmas display at Backyard Primitives & Designs in Bainbridge, where photos with Santa will be available from noon to 5 p.m. Saturday, Dec. 8 during Christmas in Bainbridge.